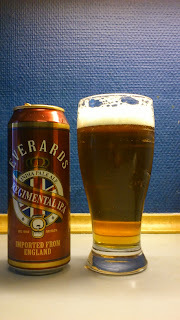 Light waft of malt, caramel and floral hops from the pour. Regimental IPA pours clear amber gold with a fluffy white head. Quite a sweet intake with malt, caramel, floral hops and tea while the finish is fruity and mildly bitter. Tea and some florals again in the aftertaste along with some light fruit and caramel. The mouthfeel is light and watery. This one left a strange dryness in my mouth so that gives me a reason enough to revisit this one sometime. Very mild with the hops for an IPA, well the modern hop bomb versions anyway, is this old school ? If anyone reading this can point me to what an original IPA actually tasted like, a beer that is made today to old recipes, please leave a comment. All in all, for the low price I have nothing to gripe about. Easy drinking, some decent taste to it and no doubt a lot better from a cask. With a good bit more flavour going on over the mentioned Original I have no problem buying and drinking this again. This scored a generous and respectable 5/10 on the ' is this discount beer ?' Beerometer.